I still like writing with my own hand and with a fountain pen. It gives all together a different feel. Well, I have stopped writing my diary, and letters. It was a good time.Few months back, I thought of starting to write again, and your post encourages me to do so. thanks for sharing. That's unique memory everyone has who cares for a personal touch in writing or receiving letters. As you say, I still had some of the letters I got from my uncle when I was in college. I kept them all in in a trunk in the attic. In fact, the attic of my house is swathed in all my childhood memories. all half pant days memories when letter would mean the light blue colour paper .. and the postman bell would bring the thrill and excitement of it may have been sent by ..
reading out somehow.. to my grandmother hard of seeing .. used to be a challenge I always wanted to win ..
Distances mattered .. words spoke .. horrible writing was criticized once people met..
Now .. u miss someone.. just grab your smart phone .. and some elderly people have also opted for emails .. :) . Poor they , dont know even emails are getting obsolete ! this essay reminded me an old habit/interest of mine .. pen friendship .. yupp ..then telephone/mobiles replaced the letters and now emails n fb msgs .. it reminded me another habit of mine .. writing a lil poem on greeting cards ( for frnds) ... and so on ..
@ Niranjan - The fact that you still write is great..a lot of people have become completely dependent on the keyboard.. Letters have a magic of their own. Imagine love letters! Now a days it is plain and boring sms. 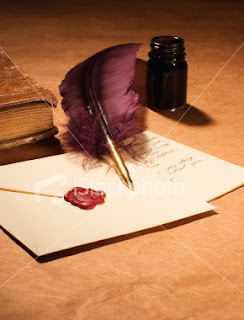 Oh I love writing letters!! I may not belong to the blue paper era but writing handwritten letters are very valuable for me. Even now, I write small love notes to my husband and stick it somewhere he can see when I am out. May be a childish thing to do but it's handwritten right?? Few days back in my last birthday I received a hero pen and a bottle of ink as a gift . I was so very excited that I used it the next day in office.IIt stopped half way and my whole note had to be written again. Your post reminded me of the days in school when we played holi with pen. Thanks for writting such a beautiful post..
Nowadays I only write letters once a year on Rakhi to all my cousin brothers. It is a ritual which thankfully is still alive amongst us. Thank u so much for this post. I have a folder full of old letters n cards from grandparents, family n friends. Those were the days, the enthusiasm with which one wrote and the anxiety with which one waited for the reply!! Renu, I am mesmerized by the way you have touched this topic! I remember how we waited for the postman. Letters brought joy and excitement. Whole family read the letter turn by turn and my granmother asked us to read the letters loudly to her again and again. Now i write letters only on the occasion of Rakhi, but those too are very short as there is nothing much left to write after long conversation on phone and facebook. But I am sure, letters, even if written now also have the same charm. Once I wrote a letter to my daughter and kept it on her table before going to office. She was too excited and touched by the letter! now that you have reminded this, I will make it a point to write letters to my children. Thanks for such a beautiful post!